We made big changes to the content of both our article and chart. Even though many of our cable recommendations remained the same, we added some popular models to the list such as the super-cool Pig Hog Vintage Series PCH10CCR and the classic Fender California Series Cable. Found a great guitar? Awesome. What about a beastly amp? Great. Don’t have a cable? You’d better get hold of one if you want to hear yourself! But not all cables are built the same. Some are terrible, some are great. In fact, some cables can work out more expensive than a decent guitar! So, to help you uncover some of the best affordable leads around, we have developed a chart highlighting our favorite cables as well as a short guide to cables and what to look out for when shopping. Let’s get started. A pro-grade guitar cable for the tone purist. A stylish mid-range cable offering a natural tone. Well-made cable series that looks awesome on stage. Another good-looking cable with crystal-clear sound. This cable’s sound quality punches well above its price tag. More quality than a budget cable with cool Fender designs. A flexible, durable curly cable that’s great for smaller spaces. A popular OFC-cored budget cable with noise-free performance. Kicking off this list is a high-definition, pro-grade guitar cable from Mogami, available in lengths of 1ft right up to 25ft. While it will set you back nearly fifty bucks, this solid lead truly is one for the tone purist, with a polymer sub-shield, an Ultra High Density spiral shield and an oxygen-free copper (OFC) core, resulting in exceptional clarity and personality – probably why this cable is a mainstay in so many professional recording studios. The carbon-impregnated PVC anti-static shield layer also prevents excess handling noise, while gold connectors mean no crackle. Excellent. From D’Addario’s Planet Waves, this mid-range cable is a dramatic step-up in quality from most budget cables but still remains very affordable. Available in both straight and right-angle connections, and in lengths of 10ft to 30ft, this lead features an exclusive patented tip design which offers a crackle-free connection in all instruments. With an oxygen-free copper conductor, foamed polythene insulation and a durable polymer coating, the overall feel and sound quality is very natural. A great choice for gigging and recording guitarists who want transparency in their tone. While you shouldn’t buy a cable based on looks alone, it’s hard not to when they look as good as the offerings from Pig Hog’s bold Vintage Series. However, even though the woven jacket options of Orange Cream, Seafoam Green and Tartan Plaid look gorgeous, these cables are backed up by great construction. Available in lengths of either 10ft or 20ft, this straight to right-angle lead features 20AWG oxygen-free copper conductor technology and spiral shielding (with 90% coverage) for excellent sound quality and noise-free performance. 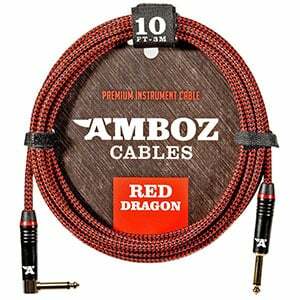 No prizes for guessing why this cool cable from Amboz bears the name ‘Red Dragon’! Available in both 10ft and 20ft lengths – in varying connector angle combinations – this cable features an oxygen-free copper core offering high levels of conductivity, ensuring a pure, crystal-clear sound. The unreactive gold-plated jacks also make for a solid, crackle-free connection. The outer jacket is made of a durable woven tweed with the cool dragon skin (red and black) design, meaning this is one robust, stand-out lead whether on stage or in the studio. This very popular cable from KLIQ comes in at under $20 but offers a sound quality that punches above its price tag. This very clear, excess noise-free sound is largely down to its 24AWG oxygen-free pure copper core, high-density OFC 99% braided shield and 24k gold-plated plugs. The attractive and robust tweed outer jacket (available in black/red, blue/red, or red/black) ensures this lead can withstand a beating on stage, while remaining tangle free. It comes in at 10ft, with options for both straight and right-angle connections. The California Series is a popular range of cables from the iconic American brand – and for good reason. The sound quality on offer is very good for the affordable price and a big step up from budget cables. This is thanks to the braided shield, stranded with an oxygen-free copper. Available in lengths of 10ft to 20ft, this cable comes in three cool colors including Candy Apple Red and Surf Green. Although the cable jacket is a little stiff for some, it proves very durable and performs well on stage. Curly cables can be incredibly convenient when you don’t want excess lengths of cable gathering dust or waiting to be tripped over. This offering from GLS Audio proves a smart choice when going curly. This affordable lead features quality components including an oxygen-free copper insulator shield and a conductive PVC shield, as well as a high-quality black rubber jacket which – combined with the curly design – makes for a flexible, durable, stage-worthy partner. Note that, although it is marketed as 20ft, it’s technically only a 10ft cable when fully stretched. Of course, you don’t need to spend more than ten bucks to get a good cable – especially if you are a beginner or casual bedroom player. While there is a huge range of budget cables to choose from, this affordable GTR-210 from Hosa is a very popular choice. It offers no frills or innovation, but has a solid build featuring an oxygen-free copper core and a high-density OFC braided shield, offering a clear sound and excess noise-free performance. Available in lengths ranging from 5ft to 25ft, it’s a great budget lead. Chance are most guitarists don’t really care about the anatomy of a cable – as long as it works, that’s the most important thing! However, sometimes it’s worth familiarizing yourself with what goes on under that exterior jacket, so you know what to look out for when shopping. Starting with the middle of the cable you have the center conductor. This important copper conductor will carry the audio signal via an electrical current. This will be insulated, then covered with an electrostatic shield to reduces the cracking noise that sometimes happens when moving the cable. This is then enveloped in a braided shield, which will block interference from outside sources such as EMI and RFI. Finally, we get to the part you actually see – the outer jacket, which is the cable’s first line of defense against the elements and makes it safe for guitarists to use. While all cables share similar characteristics, there are many differences between an average cable and a great one. While you don’t need to know all the ins and outs, let’s take a look at what affects sound quality, durability and reliability. Let’s start with the central point of a cable, the conductor. Traditionally conductors are made from standard copper, as copper is a great signal conductor and cheap to produce. The best cables these days tend to feature either oxygen-free copper (OFC) or linear-crystal copper. These purer versions of the metal are considered to improve the cable’s performance and therefore the tone you receive. These are the 1/4” jacks that plug into the instrument at one end and the amp at the other. These jacks are made from either silver-plated or gold-plated metal. Both work well and, while gold is said to be the better connector material, the difference in tone isn’t particularly big. However, gold resists tarnishing, so gives the cable a much longer lifespan. It’s worth looking at the shape of the connectors too. Most cable manufacturers will offer cables in choices of straight/straight, straight/angled and angled/angled. There’s no difference in the performance, so what style you pick will depend on your personal preference. Another often-overlooked aspect of cables is the length. The longer the cable, the weaker the signal. Therefore, there is no benefit to buying the longest cable you can find unless you are going to use the entire length as some point. Instead, you will want to pick a length that suits you and where you are playing. For example, if you are playing in a bedroom right next to your amplifier, a 5ft cable will probably be ample. If you prefer something a little longer or are planning to play with a band – whether jamming or playing smaller gigs – 10ft to 15ft is a good call. If the bigger stages are calling, or you are a guitarist who likes to strut around while you perform, 20ft to 30ft may be best. The shield is the part of the cable that keeps sonic interference from getting to the center conductor, where the audio signal is passing. The best cables use a braided copper shield, which blocks both EMI and RFI, leading to the least interference and best sound. You can also have serve shielding and foil shielding, which are found in cheaper cables. While these still work, they offer less protection than braided copper. Technically you could spend $6,000 on one guitar cable. That’s right – the Golden Oval is the most expensive guitar cable in the world, crafted in America by Analysis Plus. Described as ‘heirloom quality’, this very special cable is made with 100 percent oxygen-free copper and is coated with pure gold. Of course, the pure tone is spectacular, while it’s incredibly durable. But, unless money is no object and you are chasing a specific tone, you would probably prefer to spend less than $6,000… less than $100 even! Thankfully most premium cables sit between $30 and $70, while good stage-worthy cables come in between $10 and $30. For most guitarists, that is all you would ever have to spend. When it comes to cables, there is a lot of information to take in when compared to other accessories such as guitar stands and guitar straps – but don’t let it overwhelm you! We hope that this guide and our chart has inspired you and helped you to learn a little about cables. Ultimately, if you go with a highly-rated model that suits your budget and style – and don’t just buy the cheapest thing you see – then you should end up with something that will enhance your tone and last a long time. I prefer to use Shielded Twisted Pair cables rather than Coax designs as they are much more reliable, preserve my tone more effectively, save me money (I’m not replacing broken cables regularly), stay noiseless and help save the planet as they are repairable. I have one that is 12 years old and performs as new despite heavy use and abuse. These excellent leads are Chord Company Cream Cable which are made in England by people who actually like music. Cream is a reliable, top tone tool! I hope this is useful to players everywhere. I won when I changed from buying my usual coax cables to buying the Chord Co Ltd Cream cables as mentioned. It’s been 8 years now since I got my first of them and it’s still going strong. I feel it was an important step to make and I’ve gained a lot in playing enjoyment and creativity as well as having reliable, durable cables. As expressed in the above article, it’s definitely worth trying the alternatives to see how it goes with you.